SEO huh? Are you getting value or bamboozled? Search Engine Optimization is about doing business properly. Think about how you do your thing. When you do it right, you get the reward. When you do it poorly, you get penalized. I’m certain you have discovered there are no shortcuts to excellence. Whatever business you are in, whether you’re selling a service or a product, a systematic process ensures that you consistently deliver on your promise. SEO is no different. So what do you need to be aware of when choosing an SEO company? You’ve probably been on the receiving end of those unsolicited emails promising top rankings on Google. 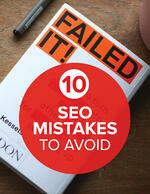 It’s because of these tactics that SEO services can sometimes get a bad rap. If the person offering you SEO services doesn’t know anything about your business or your market dynamics, how can they really deliver on their promises? To help you better understand what’s involved, we’ve assembled a cheat sheet you can use to educate yourself on the process of SEO. It will help spot the difference between the sharks and the saviours. Knowing who you are and what markets you serve is step one. Without clearly defining this, any SEO project you undertake won’t work. Unless you know what you’re selling and to whom, any efforts you undertake to attract new opportunities will fail. Sit down with your team and clearly identify the core of your offering. This information will help you and the SEO company put together the framework that will get the best results for your business. When you type a phrase into a search engine, you expect to find the most relevant search results to be presented to you. How does the search engine decide which results are to be listed and in what sequence? They use bots to crawl and index millions of pages of content from around the internet. Then they apply criteria (algorithms) to sort through the content. At the end, search engines list only those web pages that contain the most relevant content to a given specific search term. If your website does not include information that aligns with those search terms it is deemed not relevant and it will not show up in search results. Identify your competition and what they are doing in the digital realm. Your competitors’ websites can be a great starting place for researching keywords for your own website. Make a list of competitors, and then use an SEO tool like SEM Rush’s Domain vs. Domain tool to identify which keywords they are using to attract people to their site. This is a bit of (legal) espionage that will serve your own SEO efforts well. By doing this research and compiling a list of competitor keywords, you’ll be able to identify similar keywords you can use for your own website. Alternatively, you may even find gaps in your competitors’ keyword strategy by identifying any keywords they could be using, but aren’t. If your business offering fills these gaps, you can use these keywords to help differentiate your website content. These actions will create the foundation for your SEO efforts. Start with easy wins. Using a keyword research tool, you will be able to identify the terms that you can easily rank for. Initially focusing on these keywords will help your website gain some traction. You see, it’s about establishing authority. Search engines do not forget anything. Every interaction is documented. The more interactions you have in one part of your business, the more authority you will build to support other areas of your business. A tip worth considering: Bots need to be indexing your pages in order for your SEO to be fruitful. Help the bots out by providing a robots.txt file and a sitemap. You may also want to make sure that you are not cannibalizing your pages for the same keywords. So, go through your content and make sure you do not have duplicate content that competes with itself. Taking the time for this step will ensure your SEO program gets done properly. SMART goals will allow you to evaluate and re-adjust the program while it is in motion. Understand that search engines like Google, Bing, and Yahoo also know about your social media efforts. They give bonus points if you are active on social media. This isn’t something the SEO companies generally help you with. But it’s important to educate yourself on the importance of social media, and encourage you to be active on the networks that work best for your business. Be aware that in today’s business landscape, your company must participate in the conversations that are happening in your industry. This not only helps you increase your brand awareness and build more relationships online, it also has significant impact on your search rankings. Everything is connected. SEO is about rewarding those who share their expertise with the world. You should have a detailed content strategy that starts with defining your service offerings. Each piece of content you publish should be aligned with your business goals, while at the same time solve the challenges of your ideal customers. Search engines document which websites link back to your own website content. The more authority those other websites have, the more points search engines award you when they calculate ranking. It’s a challenge to get high-quality links, and the process can be very time-consuming. Working with a professional SEO service will make this process much easier for you. Make sure the links they provide are indeed “quality” and that their contractual obligation is based on delivering links, not just attempting to build links. There is a distinctive difference. SEO is a beast that needs continual feeding. Keep publishing authentic content and regularly update existing content. This will ensure you continually improve and maintain your search rankings. SEO is a marathon, but search engines reward the finishers. Make sure the SEO company you decide to work with provides regular reporting using terminology that you understand. Hold them accountable for describing what they are doing and the results they are producing. Accountability makes everything better. Shortcomings are identified and adjusted to align with the Company’s goals. We hope you now have a better understanding of the process around starting an SEO program, and what you and the SEO company should be working on to ensure success. Equipping yourself with knowledge about what is involved will empower you to find the best SEO partner for your business. SEO works, and there has never been a better time to implement it on your website. It does require an on-going investment in time and resources. But it's an investment that will pay dividends in the coming months and years, as you start to see increased website traffic, more wide-spread brand awareness, and ultimately, increased business revenue. Do you have a question about an SEO issue we didn’t address here? Share it with us in the comments and we'll get back to you with some answers. SEO is always evolving, so it’s important to stay on top of the newest developments. Download our free PDF guide below to learn how to make sure your next website redesign is SEO-friendly. Thinking about using SEO to optimize search rankings for your business? Before you jump in, read this white paper to ensure your program is truly successful.